Lake Taupo offers plenty of relaxing ways to take to the water, such as on the steamboat Ernest Kemp, but for a much wilder time head down to the Huka Falls for a spin on the Huka Jet. 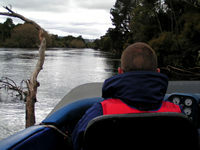 The Huka Jet Experience is 30 minutes of exhilaration as you zip along the Waikato River at an incredible 80kmh. 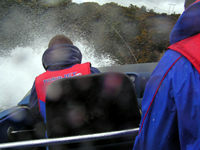 In the powerful Chevrolet V8 jet boats you speed past cliff edges and trees, hurtle across the waters and - upon a twirling hand motion from the driver - you suddenly spin 360 degrees as the boat turns within its own length sending spray and wash up around you. All the pictures I have seen have made the spins look exciting - and a little worrying - but on board you don't have any qualms at all. It is just great fun. 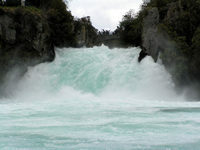 On the Huka Jet you’ll travel to the base of the Huka Falls and watch from water level as the icy blue torrents rush through the gap at an amazing 220,000 litres per second. The power of nature rarely is more apparent. On your journey you'll pass by the Wairakei Thermal Power Station - which uses underground geothermal activity to produce hot steamy water - the fascinating Prawn Farm and the Aratiatia Dam. All your wet-weather and safety vests are provided for your trip and you can get photos and videos taken of your experience. Children must be at least 1 metre tall in order to ride the Huka Jet. The Huka Jet operates every day of the year, except Christmas Day, and there are summer and winter hours of operation. Winter Season (May - September) 9:00 a.m. to 4:00 p.m. Trips depart around every 30 minutes depending on demand. Still cameras in cases are welcome on board but at your own risk. Video cameras are not permitted. The Huka Jet's crew recommends that in summer you bring sunglasses and sunblock and in winter take along a hat, gloves, jacket and warm clothing. And believe me in the colder weather you need all of those because it can get dashed cold.